We are proud to inform you that Indiarubberdirectory.com contains more than 20,000 web pages. 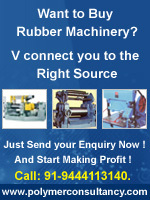 Indiarubberdirectory.com is being promoted continuously through internet on various search engines like google, yahoo, Windows live,msn, aol, altavista etc., which results your products/services get high visibility and reach targeted global rubber buyers mind.So advertising your valuable products/services through IRD, will help you to reach millions of potential buyer's mind more effectively and efficiently. Banner advertisement programs are more effective and cost saving for the SME and Corporates to elevate and build brand image and generate more business volume. By unique banner advertisement place your company/products/services in front of highly-targeted traffic our portal. Banner Ads are directly connecting the buyers to your websites. Banners are a great way to enhance your visibility, brand image, customer loyalty and trust about company on the potential buyers mind. You have the option of placing your banner advertisement on main category pages, specific product pages, or on keyword results pages � providing you the ability to deliver a specific message to a potential buyer. This results into more opportunity to do more business volumes. Want to achieve maximum exposure and global reach. 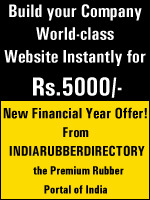 Place your banner ads on Indiarubberdirectory.com now!